No older RPG tradition exists than the vast, danger-filled dungeon. Multilevel mazes of trap-filled crypts, monster-haunted caverns, and wealth-laden vaults have lured countless would-be heroes to their dooms, yet paradoxically, the greater the dungeon and the deadlier its secrets, the greater the pull seems to be for the adventurer. 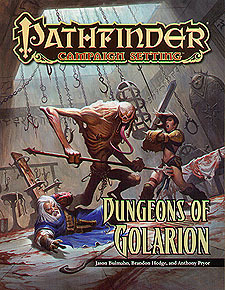 Dungeons of Golarion looks at six different locations spread throughout the Inner Sea region of the Pathfinder campaign setting. A level-by-level breakdown of each megadungeon summarizes the dangers and rewards awaiting discovery. Each dungeon entry is accompanied by stats for unique monsters, sample traps themed for each site, and details on some of the more unusual and interesting treasures awaiting discovery within. Maps providing the layout of sample dungeon levels and cutaway views of entire megadungeon complexes round out this invaluable resource for any Game Master seeking to return to the roots of the game. Candlestone Caverns: An extensive cavern network in rural Andoran that connects to the dealdy Darklands below. Gallowspire: One of the deadliest dungeons in the world - the prison of the lich known as the Whispering Tyrant. Hollow Mountain: The mysterious mountain stronghold of Ancient of ancient Thassilon's Runelord of Wrath. Pyramid of Kamaria: The deadly tomb of one of Osirion's most notorious and feared pharaohs. Red Redoubt of Karamoss: A unique siege castle filled with weird technological marvels from the savage land of Numeria. Zolurket Mines: Abandoned by the dwarves who created it, this mine now serves as the lair of a sinister undead horde. Dungeons of Golarion is intended for use with the Pathfinder Roleplaying Game and Pathfinder campaign setting, but can easily be used in any fantasy game setting.